If your company has grown to a point where more than one person is handling email from customers, that’s a good moment to create a voice and tone guide (or you might want to call it a style guide). Simply put, this kind of guide explains what your company’s email personality looks like, and how that personality is expressed in your team’s written communication. Think of the emails your team sends as part of your company’s “brand voice,” to use a marketing term. Every communication–even the most routine one–is part of your company’s overall presentation. An email might seem less important than, say, a post on your company blog or the copy in a display ad, but emails contribute just as much to your company’s reputation as more visible kinds of content. This is where a good style guide makes a huge difference. It helps ensure that your customers have a consistent and positive experience with your company. Your voice and tone guide is a document that everyone in your company can use, but the members of your team who work directly with customers team will especially benefit from it. A good style guide also makes integrating new hires much easier, as they start with clear expectations of what their communication style should be. It’s best to start by defining these two terms since they mean different-but-related things. The “voice” component is an expression of your company’s culture. Do you have a casual environment or a more formal one? Does your team communicate with customers about serious matters, like bank accounts or insurance? Or are you talking to customers about more fun subjects, like vacations or pets? Does your team call customers by their first name, or “Ms. Smith” or “Mr. Jones?” Does your team tend to joke around with customers and use slang terms, or is a more serious demeanor more important to establishing trust? All of these ideas are elements of your company’s overall voice. 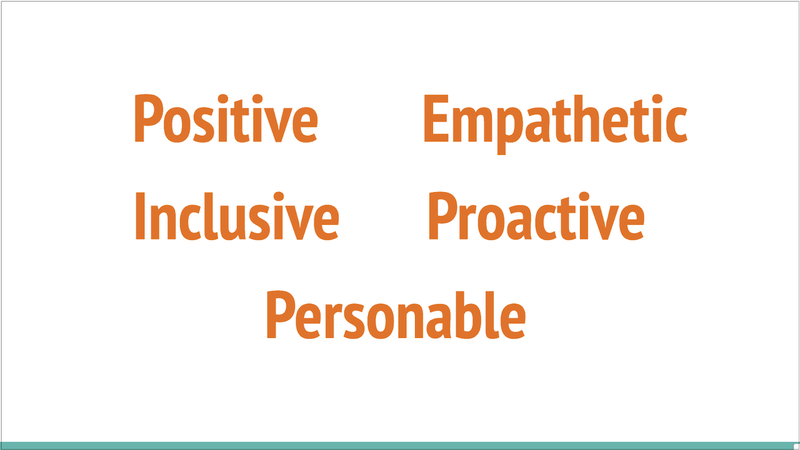 Can you come up with three to five words, like the sample below, that describe the personality your company wants to share with your customers? Your list of voice qualities is the start of your guide. Tone, on the other hand, is a secondary element of voice. Your company’s voice should stay consistent no matter the situation. But the tone of an individual email might vary based on what it’s communicating, while it still retains the elements of the company’s overall voice. Here’s a good example: Let’s say you run a software company. The company’s overall voice is friendly and straightforward and always aims to educate your customers on using your product. You can email a customer to thank them for the nice review of your product they shared in their social media channels. 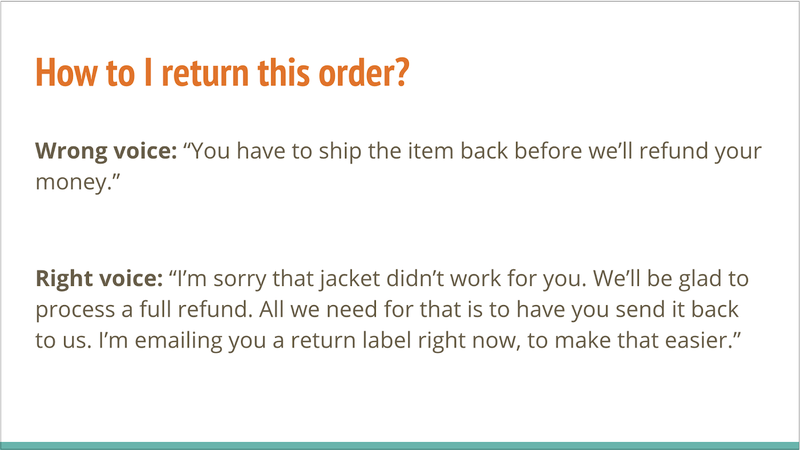 You can email a customer explaining why the refund they’ve requested is outside the scope of your refund policy. The language you choose might be a little more bubbly in the first email and a little more serious in the second, but both emails can still be friendly, straightforward, and educational. You’re keeping with the company voice, even as your tone shifts a little for different situations. We’ll talk more about how to represent tone in your guide in a moment. The next step to building your voice and tone guide is to take a look at your company’s customers and get a sense of who’s receiving all those emails your team sends. If your company has any customer personas, those are a great resource. If not, you may want to spend a little time looking through some email history. Who, specifically, are we emailing? Who is our primary customer? What needs of theirs does our company fill? What would they like to hear from our company? Let’s say, for example, that your primary customers are parents of young children. What are some of their needs, as a customer group? They’re likely to be short on time, and may be busy and distracted. And they probably would like to feel that your team likes children and understands the demands of raising them. So, what are some ways you might address these needs in your company’s emails? You might keep emails short and clear, so they don’t require much time or focus to read. You might limit the number of questions you ask a customer in any one email, so they won’t have to spend too much time on their reply. The whole point of a voice and tone guide is that it optimizes your team’s emails to best serve your customers. So what can you glean from your customers’ needs? Add these ideas to your guide. This part of the process can be a fun team exercise. Now that you’ve thought about the customers who receive emails from your team, it’s time to explore what your team believes its values are as a customer service group. Gather your team together in an area with some open wall space. Give everyone a pad of Post-It notes and a marker. Now, ask the group to think about their own experiences as customers. 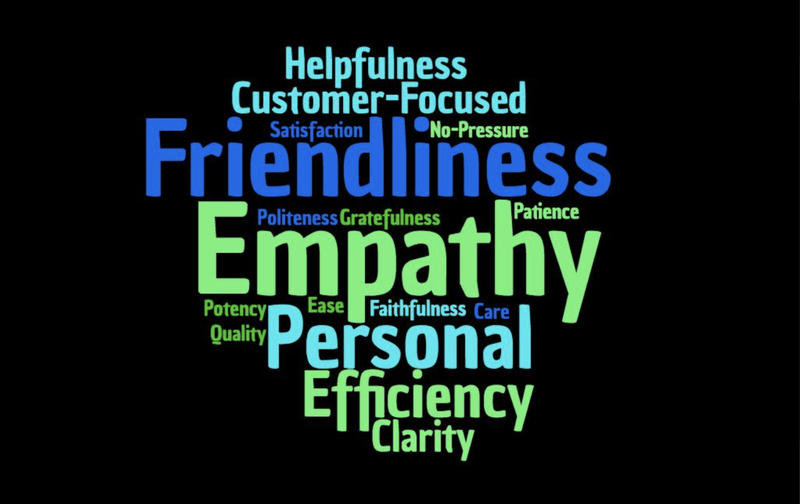 What qualities make a customer service experience positive for them? What makes a good customer service agent? Have everyone start writing down their answers to these questions on the Post-Its, trying to keep to one word per answer as much as possible. Stick the Post-Its to the walls so everyone can see them. Now, work with your team to move all these notes around, arranging them into groupings of similar ideas. You’ll usually identify a number of key themes that way. Or as an alternative, you can also use an online word cloud tool to enter all the answers individually. The resulting cloud will show you which ideas were most prominent for your team. Above is a word cloud our customer service team came up with using this same exercise. Once your team understands its customer service values, you can combine those with what you know about your customers’ most important needs—and then you’re ready for the final step in creating your voice and tone guide. As the last step, it’s time to set out some specific examples of email expression that illustrate your company voice and tone. This will be the most visceral section of your guide, and the one that will really help your team adopt the guidelines. The best way to explain this section is with an example. 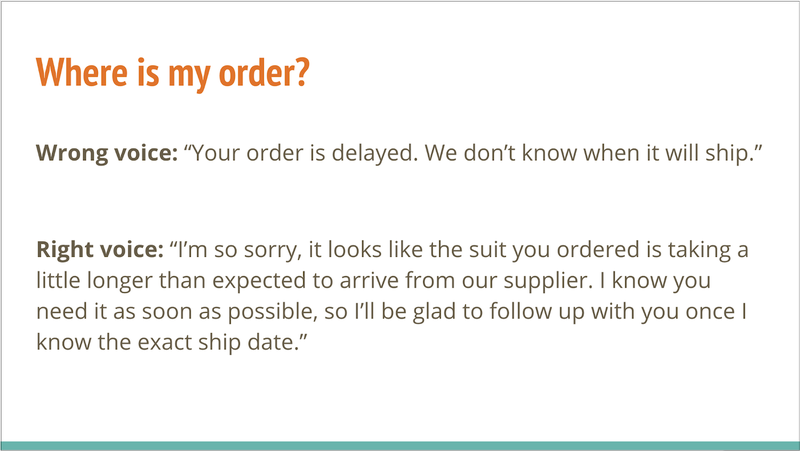 So let’s say you run an online retailer of professional women’s clothing. 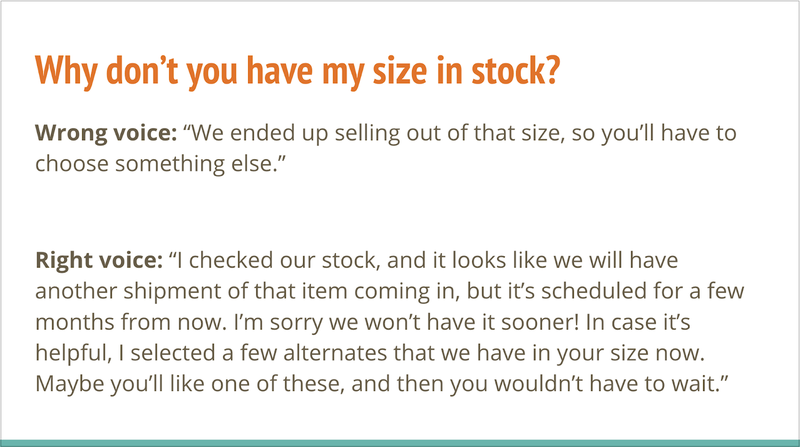 You work with customers across a wide range of sizes. You’ve done this voice and tone process, and arrived at a company voice that’s positive, personable, and inclusive. Now, what are some common questions your customers ask your team? You might want to get your team involved in building these examples. It can be as instructive to write something in the “wrong” way as it is to write it in the correct voice. Depending on how your company communicates, there are a number of ways you might share your new guide with your team. You can put everything in the form of a document, or maybe a slide presentation. (In fact, the examples above come from a slide presentation guide. It’s a nice, graphical way to present this kind of information.) Just make sure your guide is stored somewhere that all members of your team can access, like your company intranet, or a sharing tool like Google Docs or Slides. If you have a new-hire training packet, it’s great to include the guide in that. And if you have a team or all-company meetings, taking a few minutes to go over the guide periodically helps keep everyone on the same page. It’s also a great idea to create some email templates that your team can use as a starting point for responding to frequently asked questions. They’ll save you time, and they’ll also serve as a regular reminder of the type of voice and tone your team should strive for in every message. Lastly, it’s a good idea to set yourself reminders to revisit your guide annually. As your company grows and evolves, your voice and tone may need updating.